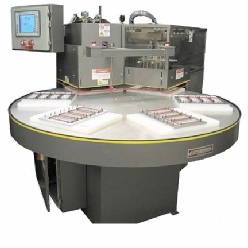 Rotary medical blister sealers,heat seal tray sealer for high throughput of medical thermoform trays. Optional tray and lid loading. Validatable heat seal controls. Cleanroom compatible. Optional leak tester for 100% inspection. Shuttle style medical validatable tray sealers, medical blister sealers, for medium to high throughput of medical thermoform trays. Standard controls or validatable heat seal controls. Cleanroom compatible. 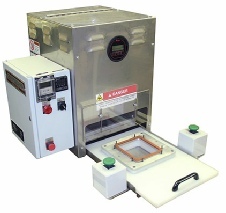 Single or dual shuttles for medical blister sealers. Table top validatable medical blister sealers, thermoform tray sealer, heat seal presses for small product or laboratory development. Sealing of medical thermoform trays. Standard controls or validatable heat seal controls. Clean room compatible. Medical Tray sealers made in USA. Medical validatable blister and medical tray sealers. 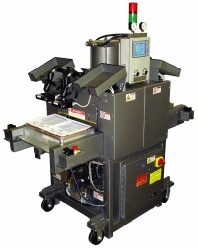 Platen press tray heat sealers from rotary tray sealers and floor shuttle tray sealers to table top tray sealers. Validatable control systems for medical trays sealing are available. Custom shapes can be produced. Click for equipment for printing directly on Tyvek lidding.